If you have been reading this blog from the beginning (hi mom!) or you know me personally, then you've heard the story of Darla. I blogged in detail about this little miracle puppy here. Long story short, Darla showed up on our doorstep one evening while we were living in Florida. She was hungry, wet, and injured (we later learned she had been hit by a car). We took her in and tried to find her owners, but nobody claimed this little pup. We named her Darla in the meantime but were really hoping to find a home for her. There was no way we were going to take her to a shelter. Since she was injured, we knew they would just put her down. 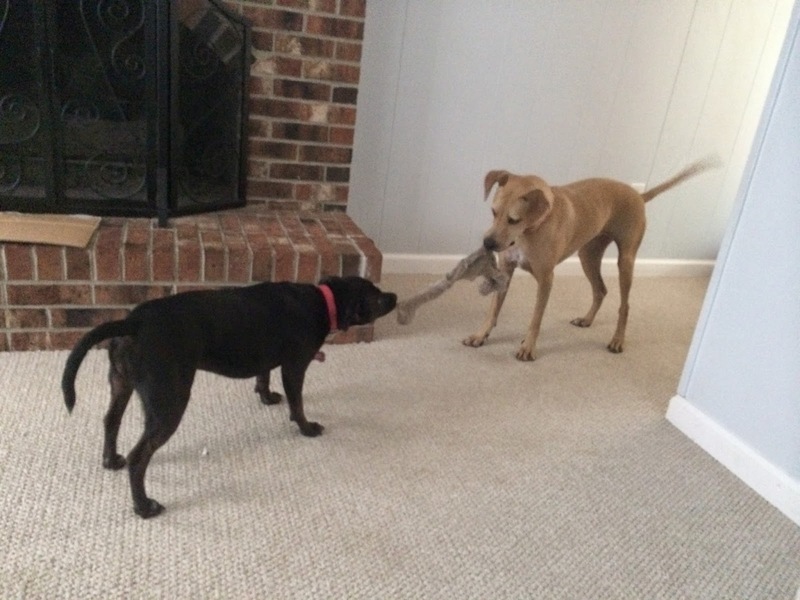 One of our friends had been thinking about getting a dog, so we invited her over to come meet Darla. 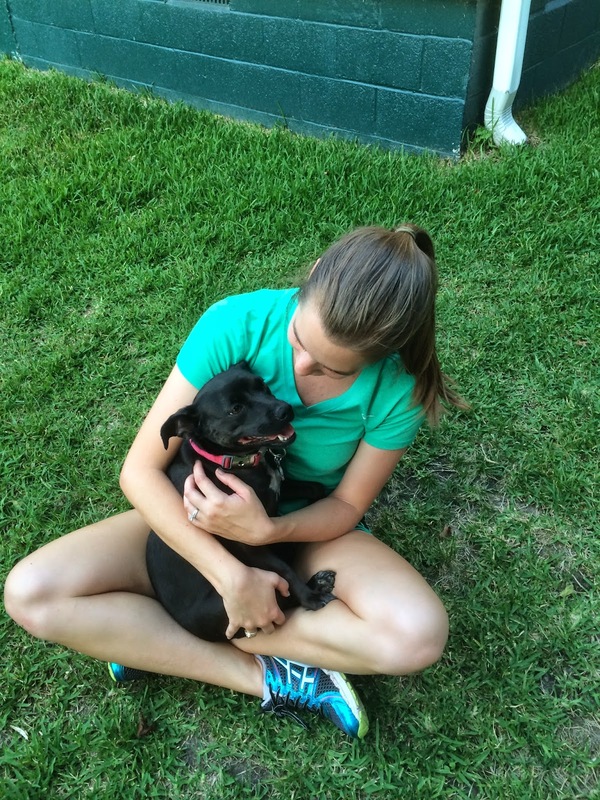 The two instantly fell in love, and Darla had the perfect new mom. They've been an inseparable duo ever since! Her mom is going to be away serving our country for a while, so Darla has come to live with us for the time being. She is one of the sweetest dogs you will ever meet. She loves to snuggle, loves to be held, and loves to be around people. She also sits like a human, which I find pretty darn adorable. Jenny sits like a dog (makes sense, right? ), so this "human sitting" thing makes me laugh. We are going to have her for a good chunk of time, so we are adjusting to life with two dogs instead of one. Let me tell you, it has been just that: an adjustment. We know Jenny inside and out. I joke that I know her better than she knows herself. We have her trained exactly the way we want her, so she's super easy. We are getting to know Darla and working on teaching her how we want her to behave. She is catching on very quickly, but it has definitely taken a little patience from both of us! Thankfully, she's really smart and a quick learner. I think having the Jen pup has really helped too. Darla seems to follow her lead, so Jenny has helped her learn our rules and expectations slightly more quickly. Jenny has loved having her around. We call them pseudo sisters, and they do everything together. I am working on getting used to the added noise that a second dog brings. Now that Jenny has someone to play with, that is the music I get to listen to throughout the day. I love seeing them both so happy, so I don't mind it so much. We are about a week into life with two pups, and it's going really well. The first couple of days were a bit of a challenge, but this is finally starting to feel like the new normal. I lucked out in the husband department with Parker, who is really go-with-the-flow and accepting of change. 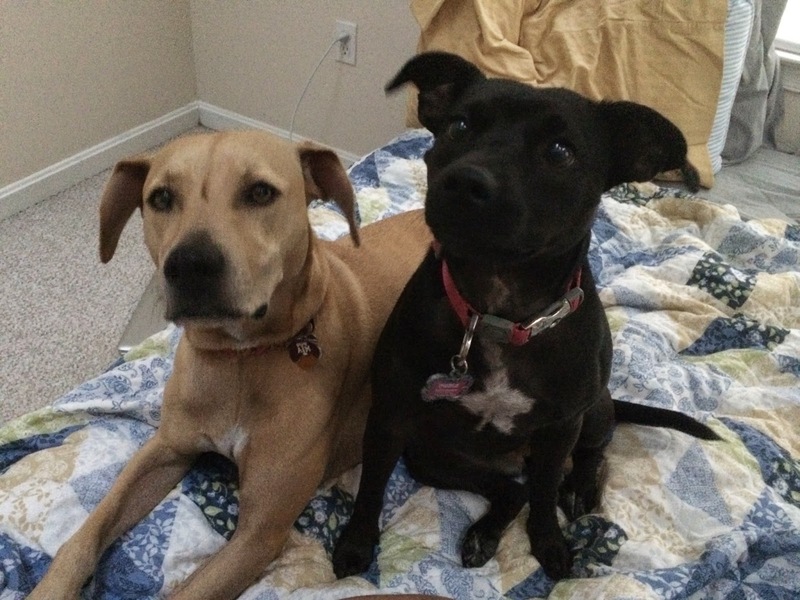 Being slightly resistant to change and thriving on a consistent schedule, I have been the one who has really had to get used to taking care of two pups. Like I said though, all is good now. This is just the new normal, and we are happy to have her! We had no idea this little miracle pup would continue to be a part of our lives almost 2 years later, but God has a way of changing things up when you least expect it. She's baaaaaaack! It may only be temporary, but we are now a family of 4! Oh my goodness, she's such a cutie! Look at Jen being such a good big sister! how cute is Darla! and oh my that human sitting thing is both funny and super cute!!! Awww what a little cutie!! I love the "sitting like a human" picture. So cute!! That's so sweet! It looks like she's having fun being back, too! 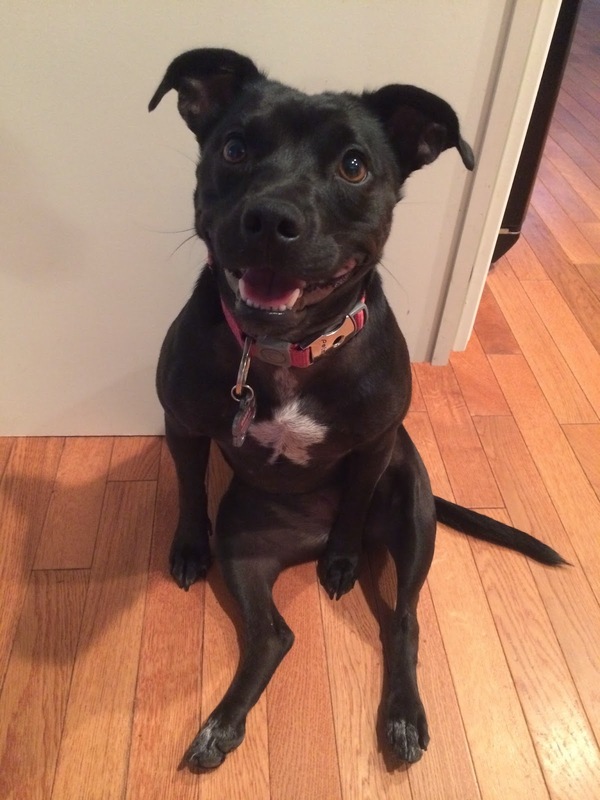 oh my goodness - the picture of her "sitting like a human" = adorable!!!! She is adorable!!!!! haha Yadi does that human sit sometimes too! She did much more as a pup and toddler, but now that she's a little bigger, she doesn't do it as often. This is such a sweet story- so glad she'll be back with you guys again! My brother found his dog the same way-- just kind of showed up at their apartment a mess & now they love her! Darla is just adorable! I'm glad y'all have her for a little while. Oh my gosh, the human sitting! Adorable! Love! And so happy you didn't take her to a shelter - she totally would have been out down. What a great heart you have to open your home and help a friend & pup. Jen looks like she is having a blast with a new friend in the house. This makes me a little nervous when I think about us opening our home to another dog through fostering. I don't think of the adjustment from one to two dogs. I hope it's not too stressful. I'm not good with change either. You guys are amazing for opening your home to her! So sweet. I remember the story of Darla! (I may or may not have read all of your posts.) So glad you get to spoil her while her mom is away! Hi Sweetie! She is a cutie, and I know Jenny is glad to have a playmate! I recognize that sit. I call it Bella's "lazy" sit. Too funny! What a sweet story! You are so sweet to watch somebody's baby for that amount of time. Enjoy your time with her! OMG! She is adorable. One of ours sits like that too, and it gets me every time I see it. Welcome to the two pup club! It can be challenging, but it is so fun at the same time! She's SO cute! And she and Jenny do kind of look like sisters. I laughed when I saw her human sitting position! That's hilarious! She seems like a sweetheart :) Awwww!